Articulation: Hinged ankles, hinged knees, swivel thighs, H-hinged hips, a swivel waist, a hinged abdomen, swivel/hinge shoulders, swivel biceps, hinged elbows, swivel wrists, and a ball jointed head. Accessories: Unmasked Bruce Wayne head. * While most of the previous DKR based figures have used elements from the Masters of the Universe Classics bodies, the Flash uses a classic DC Universe Classics body. It's on the slimmer side, but it works to make the Flash's build feel unique from the over-muscular appearances of Superman and Batman. It's an older body but it still works pretty well. * Considering that most of the costume is just paint work, I think Mattel did a pretty commendable job of ensuring that the Flash's outfit matches the design shown in the comic. Carrie Kelly apparently redesigned the Flash's outfit to modernize it a bit and, while it does seem weird to see the Flash in anything but red and yellow, it's a solid design. Not better than any more traditional designs, but you can see some sense of functionality here. It definitely looks more like something you'd see someone sporting in a marathon, that's for sure. * As far as I'm aware, this is the same headsculpt from the original DC Universe Classics line. 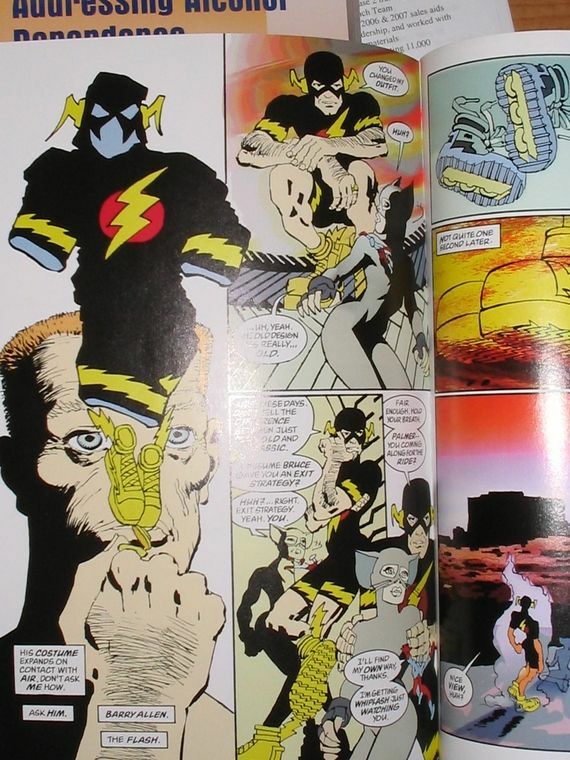 I initially wasn't sure what I thought about the head being reused but, looking at some artwork from the book again,. I don't think it's that far off model. It's still a very nice, very classic Barry Allen headsculpt. * These funky running shows really stand out, don't they? They're completely unique sculpts (because who else has ever worn shoes like this?) and they match the designs shown in the book really well. I was initially thinking they needed some black on them to break things up a bit, but they do appear to be solid yellow even in the book. Not only are they functional but they're accurate, too! * Here's the Atom! Standing just a little taller than an inch and a half, the Atom is definitely a minifigure. He isn't articulated at all but he does have a fairly nice paintjob that matches his outfit from The Dark Knight Strikes Again. The tampographic stamps of the atom logos on his forehead and stomach are really well done, too. Very neat and clean work. * Yes, we know the real reason you bought this figure. It's to have a headsculpt of an unmasked old, crotchety Bruce Wayne. And guess what? It's pretty awesome. The eyebrows are a bit exaggerated but it works. This looks great on the Armored Batman body. * In order to out the unmasked Bruce Wayne headsculpt on, I had use the "boil and pop" method: Dipping the head and shoulders of the figure into boiling water to soften things up. While Bruce's head is designed to be easily placed on and removed from the post, the original armored head was not designed for this, making it a difficult task. Someone randomly buying this figure would have no idea what to do with this! For $20 bucks you're getting an exclusive Flash figure in a very unique costume, an Atom minifigure, and an upgrade for a previously released Batman figure. To be honest, that is a pretty slick deal. I like this set. While Flash on his own wouldn't have set shelves on fire, Mattel did mix in some really good extras here to make this a tough set to refuse. It's a Great set that seems to be getting easier to find at Walgreens. The online prices are dropping on this set, so hopefully you'll find one soon! Definitely a treat for collectors of the Multiverse line and the DKR/DKR2 subset being built there. If you're looking for more Flash collectibless, check out my review of the Mezco One:12 Collective The Flash, the Lego DC Universe Riddler Chase which comes with a minifigure Flash set, the Lil Bombshells Flash (Jesse Quick), and the Nano Metalfigs Flash by himself or as part of Five Pack A! As far as I can remember, this is the first figure of the Atom I've reviewed here on Action Figure Barbecue. I've reviewed so many Batman figures that the man has his own gallery. Check out the Dark Knight Gallery for dozens of reviews of the Caped Crusader!